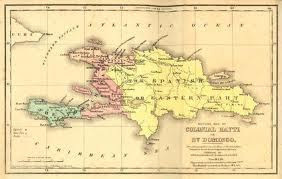 - Haiti was once a French colony (1659-1804) called Saint-Domingue on the island of Hispaniola. - In 1789 Saint-Domingue produced 60 percent of the world's coffee and 40 percent of the world's sugar imported by France and Britain. - The white planters were outnumbered by the black slaves working for them ten to one. Because of this disparity they were constantly afraid the slaves would rebel. - When slaves attempted to rebel through leaving the plantations or disobeying their masters, they were subjected to violence in the form of whippings, and more extreme torture such as castration or burning. - The Haitian revolution eventually started in 1791 and by 1792 the slaves controlled a third of the island. - One of the most successful black commanders was Toussaint L'Ouverture, a self-educated former domestic slave. - On January 1, 1804, from the city of Gonaïves, Dessalines officially declared the former colony's independence, renaming it Haiti.